So far, Denver’s protected bike lanes have been separated from traffic with a row of parked cars and/or plastic posts. This one will be different. Most of the 14th Street bikeway will have a foot-wide concrete curb in between the bike lane and the parking lane. This will provide physical separation from traffic even when no cars are parked. Hopefully, it will also put an end to people parking in the bike lane — a constant source of blockages here and elsewhere in the bike network. From Court Place to Colfax, the bike lane will have no protection, just a painted buffer, like on Champa Street. Bike infrastructure is most effective when it forms a cohesive network, and the 14th Street lane will fill a gap along a popular downtown bike route lined with busy destinations, including the University of Colorado Denver, the Colorado Convention Center, and the Denver Performing Arts Center. 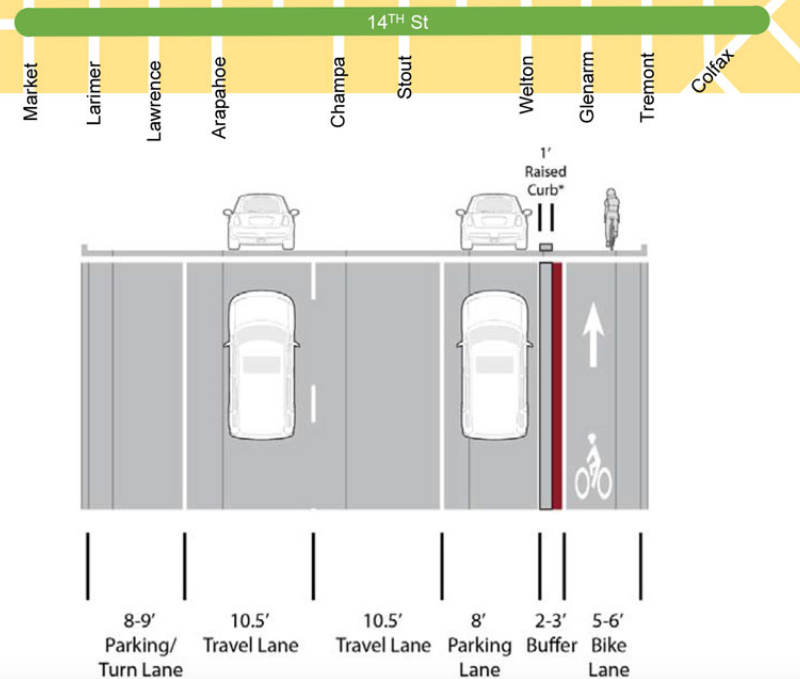 The eastbound bikeway runs parallel to the westbound bike lane on 15th Street, and connects to the Arapahoe and Lawrence street protected bike lanes, as well as a raised bike lane on Bannock Street in front of the City and County Building. By and large Denver’s bike lane network still resembles a broken chair that isn’t 100 percent safe to sit on, but this project should help sturdy those legs. This is definitely the best (would be) protected bike lane yet. I do wonder how the multiple different protected lanes impacts riders and drivers. It’s borderline confusing at this point with the number of different implementations we have. I’ll be interested to see how well a truly protected lane works with so many cut throughs.